Who has not been given a yogurt for snack as a child? 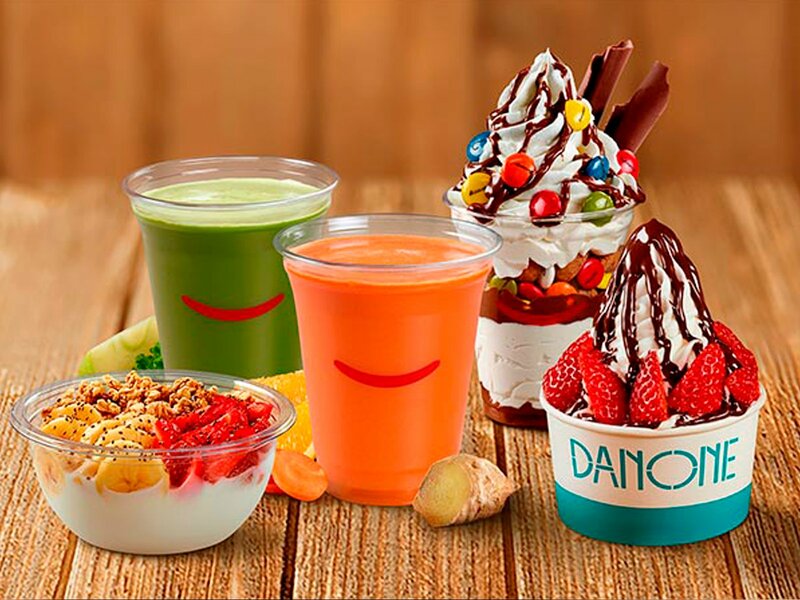 Well now you can do the same with your children by going to the Danone Yogurteria in Manoteras Leisure Center. It is not the same as the yoghurts that we eat at home, since here the possibilities are multiplied in the form of smoothies, ice creams, yoffles and much more. In addition, your home TV can transform into the huge screens of Cinesa Madrid, which you will find in this shopping center. We are talking about a brand of yogurts that will soon be a hundred years old. The first Danone yogurt was made in the Raval neighbourhood of Barcelona in 1919. Since then, they have launched many products, all of them with a vocation to make your life healthier and fun. And that is what inspires Madrid’s Yogurtería, or yogurt parlour. This place is a unique establishment within the Manoteras Center Cinemas & Restaurants. The Danone yogurt parlour is designed for indulgence. Not only for children but for adults too or as a family, since among the menu of products there are ingredients for all palates. But whatever you choose, it will be created based on three principles. One of them is authenticity, since Danone yogurts have always been created believing in what we do and how we do it. Another of our principles is to take care of the flavor of the products we offer you. The taste of our frozen yogurts is the beginning of the fun at La Yogurtería in Manoteras. And finally, the health and quality of our menu is also important. Do not be afraid, because we have managed to make some delicious products that also help you keep a balanced diet. Come to have a snack with your children at La Yogurtería Danone with total peace of mind. And of course, you will also fall for our frappes, frozen yogurts or fresh ones with a renewed appearance. A tasty, fun and healthy snack that is ideal for a cinema evening, since you should take advantage of the Cinesa Manoteras movie theatre which is at our doorstep, where all the premieres of Madrid are. We have already told you our principles and a little bit of our history. Therefore, the time has come for us to present some of the star products that you will be able to try in this shopping centre in Madrid. In both cases we are talking about products made with the Danone guarantee and their authentic yoghurts. But the difference lies in the texture and temperature at which we serve them in La Yogurtería. The first ones are warmer and creamier, while the second ones are more frozen. They are both exquisite and can be accompanied by the most varied ingredients: chocolate, fruit, Filipinos, … even some sprinkled Smarties. One step further in the constant evolution of Danone’s Yogurt parlour in Madrid are the Deli Frozen. What are they? They are delicious frozen yogurts in which you can add flavours such as Nocilla, white chocolate or fruit such as strawberries. All this can be served in larger sizes, which become our “bigs”, or bowls to share and sweeten family life. La Yogurtería in the Manotera Center is open in the morning, so you can also have brunch or a snack; of course, a very healthy snack. It’s what we’ve called the Morning Bowl: authentic yoghurt accompanied by fresh fruit and cereals, which becomes the healthiest breakfast one can have. Our menu also includes many smoothies, frappes and bowls, as well as a cafeteria for those who want to combine flavours. In any case, we have everything. For the children at home and for adults too, who will also be amazed at how those “danone” yogurts that they ate as children have evolved; this is a topic between parents and children that will surely come up while sitting at a table of La Yogurtería. And after the family talk, how about a movie in the Manotera theaters? Your day out will become perfect!